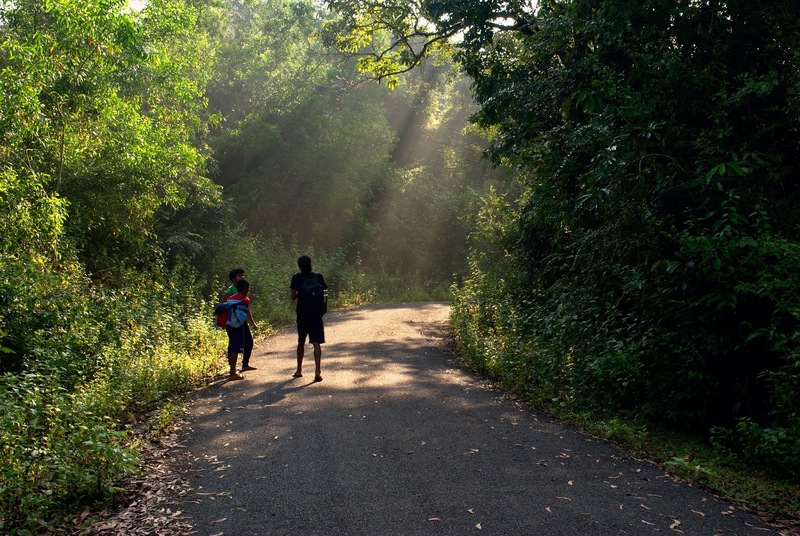 As an attempt to keep my feet off my home city of Delhi and close to the nature, I found myself Wooffing in the lush hues of green and brown and yellow in the Angadibail Forest of Uttar Kannada. With birds chirping through a silence so subtle, a local lady helped me to the Angadibail home of Buda Folklore where I was to volunteer for their upcoming Kokum Harvest Festival. And Kokum did I harvest, climbing those slender trees like my pre-evolution monkeys. Big red fruits, some sweet, some sour all from trees to baskets to the processing units that were men and ladies and kids; separating the peel, juicing the pulp, collecting the seeds, all in all where nothing goes to waste. 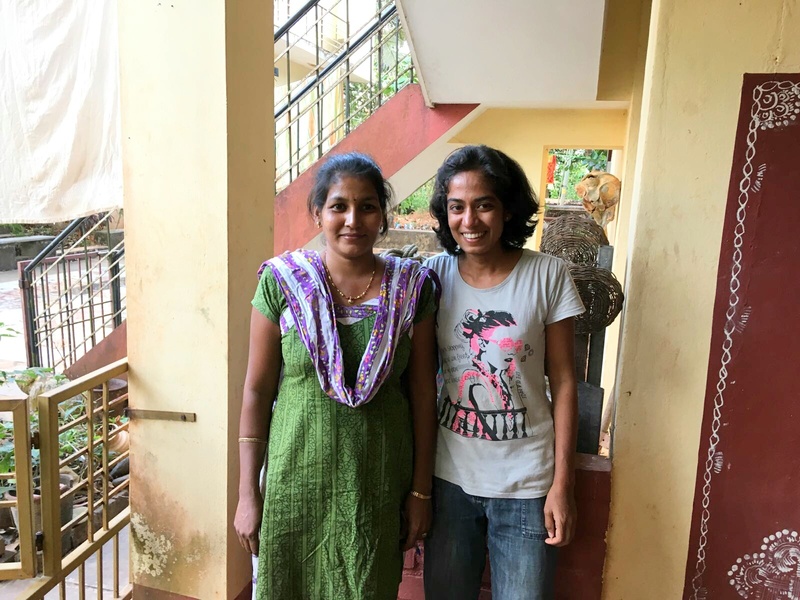 “Come with an open mind and you shall find the learning you are looking for,” said Dr. Savita Uday or Savitakki, as I like to call her, when I expressed my desire to work at her farm a few weeks into April. 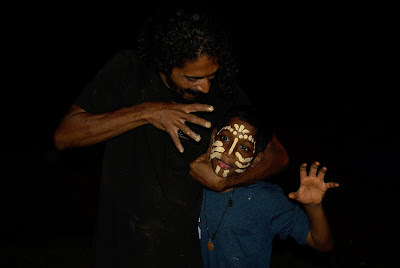 And learning did I receive, learning packed with laughter; with stories and skills from the native Halakki and Siddi tribes; with dance and healthy food; good bamboo music to suit every taste and butterflies flying in my face. The first morning of the festival was Savitakki waking us girls with her musical “hey girls, we need some help”. 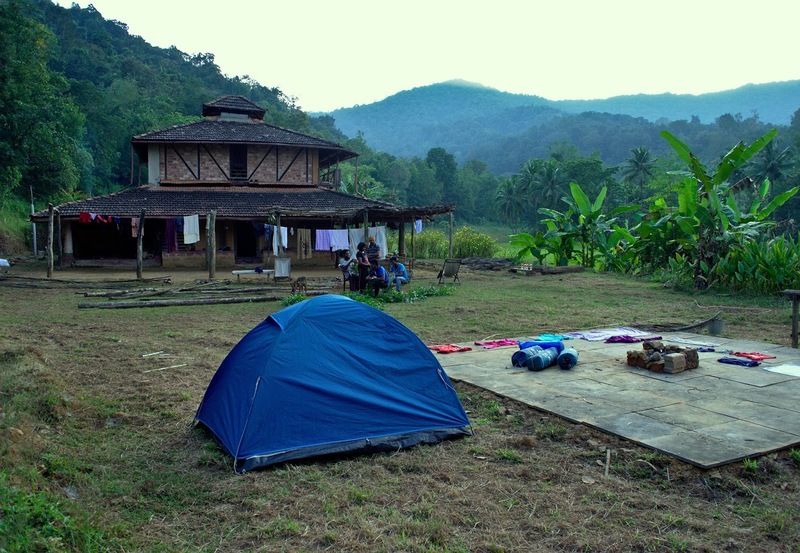 The previous night, Harita and I had retired to one of the Machans, where this wonderful platform under a Fig tree became our bed under the starry forest night. 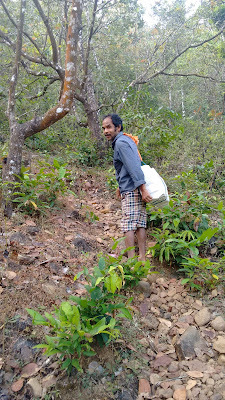 With this began a day of the festival days where I was entrusted with the morning herbal tea for the Buda community while the new friends Harita and Atmeeya sang along taking turns sweeping and mopping. Kokum, which until now was only an appetizing squash for me, turns out, is an all rounder fruit finding its uses in medicines and cosmetics too. While on one hand we got to relish the refreshing cardamom flavored Kokum Sherbat and spicy Kokum rassam, on the other we had our lovely Gopi akka (a Siddi) let us grind boiled Kokum seeds from the year before. The de-husked and ground seeds were later boiled to make kokum butter, a very important ingredient in Atmeeya’s organic soaps. And these soaps I can swear by them to trash all my Nivea and Dove products, for they moisturize as they bathe, and their scents are meant to waft off you throughout the day. Riding through the bumpy forest on a Bolero Pickup we’d go to harvest a lot of the day. With Eeshwaranna, the arms of Buda, climbing the topmost branches, it literally rained Kokums. 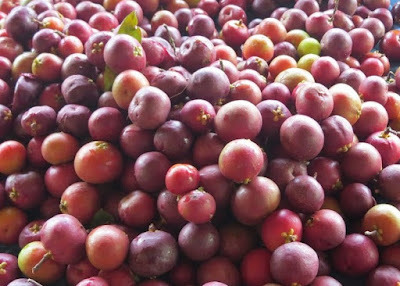 But to Savitakki’s expectations, this year’s was a scant produce with Kokum barely ripening, growing to the size of green apples even. All thanks to the climate change. The baskets filled with the fruit nevertheless had our hands full and separating the fruit parts where the good peels went into making fruit preserve and not so good to dry in the sun. The seeds were to be under the sun too till they became dry enough for butter making. So yeah, nothing went to waste, not even the stem heads for they too found their place in the soil under the banana trees. While Kokum harvesting and processing marked the lengths of our days, the afternoons relaxed into lazy naps and board games that Advitee had hand stitched into beautiful cloth patterns. The evenings had Anvay and I walk to meet the neighbors and bring home another round of milk, sharing our set philosophies and debating over worldly politics on the way. 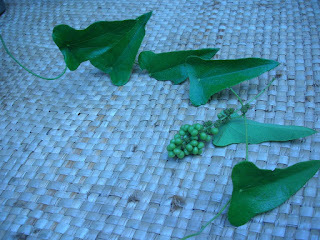 We’d come back to find the Buda community engaged in making baskets out of tree vines, or crowns out of mango leaves. One of these evenings, to my pleasure, turned out to be a Siddi dance lesson where Raghavendra and Mahabaleshwar anna sang and performed their native Konkani songs ‘Muiyan cha Kottaw’ and ‘Miya Gailo Mumbaik’. The Dholak that they played to set the beat right had us all dance our souls out with the wildest expressions brimming off our faces. Prabodha who turned out to be the best performer, rolling on the floor even, had Padmavati Akka laugh her heart out. And Padmavati Akka, what a brilliant storyteller she is! A Halakki granny, Padmavati Akka in her blouse-less wraparound of a saree and yellow and black and white beads trailing around her neck, one night sat with her lantern lit face under the starlit sky. She took the stage which was to later become our bed, walking us through the stories of ‘Vakkal Gowda’ and ‘Devvad Kathe’. To the least knowledge of Kannada that I have, Padmavati akka’s expression and gestures became a resting reliance. Such a performer, I swear! I have never seen anyone enjoy their own act so much. She just couldn’t stop laughing while telling us Devvad Kathe, this funny fable about a son’s dance with the demons. While Harita’s translation helped us understand what was being told, a bigger thanks goes to the performance itself for it had no language barring the flow. To relish the native flavors, we had homely meals of beaten red rice, new rassams every night and curry mixes and sabzis with a dessert of Kadabu or ragi barfis to top with. Thanks to Soumya akka for all her kitchen wonders of taste and aroma and Uday uncle for his score of pickles and chutneys. That Lemon and Chilly Pickle stood out to be my personal favorite. Burping our guts to relive the tastes we edged towards the nights which had us race or call dibs on any of the two Machaans. Some would peacefully settle for the attic and Veranda or they’d settle for the platform under the sky. And under the sky did I sleep for most of the nights, sometimes confusing fireflies for shooting stars, on others fireflies for predator's eyes. The diversity of cultures, energies and philosophies that the festival brought together wafted in the breeze of the Angdibail Forest through the day. While it taught me everything from the values of the beloved fruit to the lost art of basket weaving and all the dancing and singing that came with it, it incited in me an inclination towards working in a community. No meal can taste better than the one that is touched by the hands of all the people who are later going to eat it. Such solidarity and harmony seems lost in the home city with cellphones taking space on the dining tables and with one or two designated members of the family arranging the food for all. 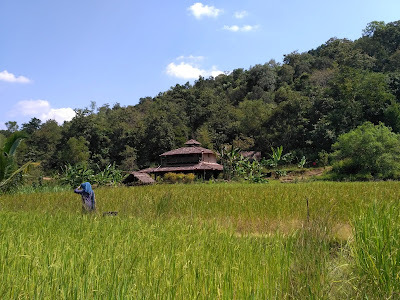 Here, with no connectivity with the outside world, a diverse lot of like minded people came together, and singing the best of Rafi and Kishore, cooked for one another. This for me was the best family I’ve ever been a part of. The farmhouse of Angdibail – its comfortable attic and homely kitchen; the dining area with a view of the farm and ‘Moti Gudda’ in the distance; the pets, Beera and Bella; and the constant chimes of everything that decorated it – had through the week-long festival seen a worldly share of ideas and appetite. 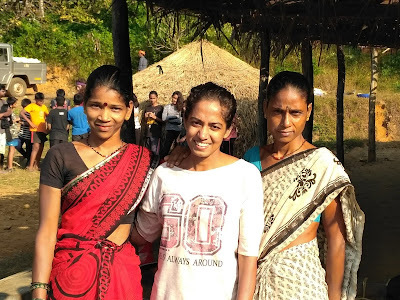 From experimenting with Kokum’s culinary abilities, to dancing with the Siddis; night walks in the forest and predicting rain, we all ecstatically edged towards the end of the festival. And soon, with the participants leaving, the days of the festival that had the forest echo with laughter and joy ascended to the music of the chirps and rustles of the forest, once again. And so came the last night of the calm and it brought with it light drizzles which had all who remained running around to save the produce from the year’s harvest and processing. Marking a brilliant end to the bustle in the calm, the rain went away soon after. And soon after came the moon lurking out of the skies and it lulled the forest good night. 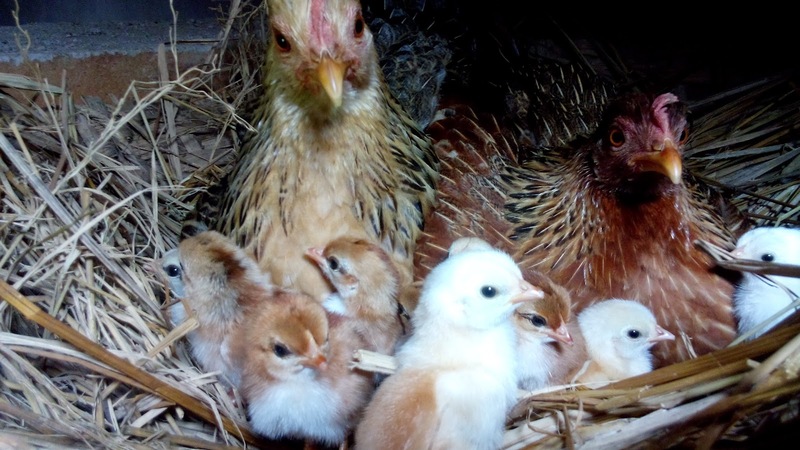 Diversity is what attracts me and one of my interests has been plants and food. 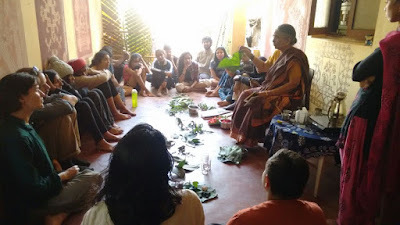 My curiosity increased when I came across people mentioning a lot about the uses of uncultivated plants/weeds during our farming module at Bhoomi college. I had seen my mom and grand-mom using some uncultivated plants for cooking and over time I had moved away from my hometown and noticed that I was forgetting whatever little bit I knew about these weeds. So, when we were given two months of internship time at Bhoomi College I couldn’t stop myself from looking out for places where I could learn about these weeds, visit different places and meet new people. That is how I spoke to Dr.Savitha Uday (we fondly call her Savitakka), founder of BuDa Folklore and landed up at BuDa Folkore spending half the time at Honnavara and the other half at Angadibail during my internship period. After my college days, it was the first time for me to go alone leaving behind family and friends for one and half months due to which I was a bit skeptical as to how my internship would pan out. But as soon as I reached BuDa at Honnavara I met Shanthi Nayak( we fondly call her Shantiamma), Savithakka’s mother who is a walking encyclopedia extremely passionate about her work. 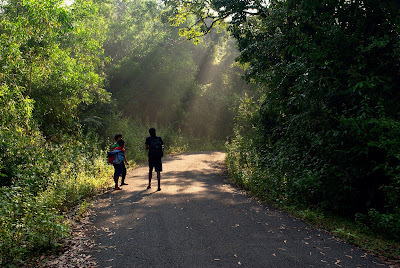 Soumyakka (one of the integral members of BuDa, manages almost everything @BuDa) informed me to get ready quickly to join the river route trek, which is part of the study tour conducted for school kids by BuDa. I did not know how to react when she showed my room which was next to an in-house museum. Too many exciting moments in a short time. After making a silent promise of coming back and seeing the museum properly I left for the river route with Atmeeya whom I can call as an ecologist because of the amount of knowledge he has regarding the environment, wildlife, and many others. This river route was basically a trail along the river Sharavathi almost from her source to destination exploring the nature, history, livelihoods of people on the way. 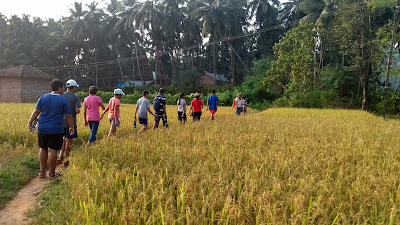 It was a great learning experience for me as I got to see quite a few interesting plants while walking along the farms where paddy was just harvested. 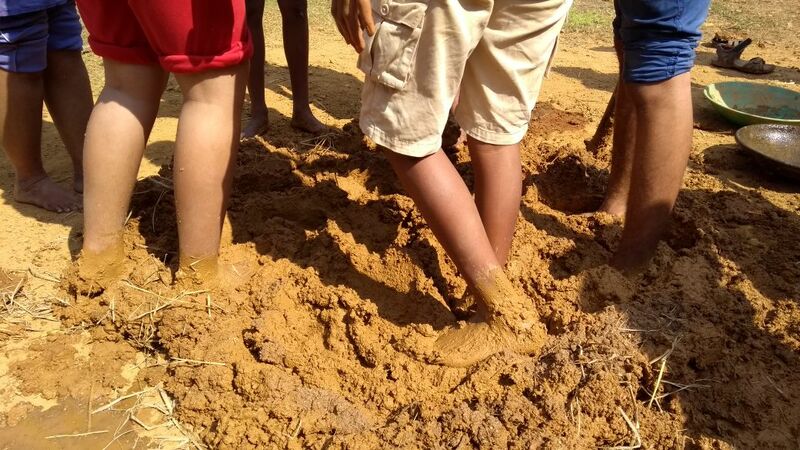 Small-scale Sand Mining using just a long stick and a bucket mechanism was done near a place where we camped. 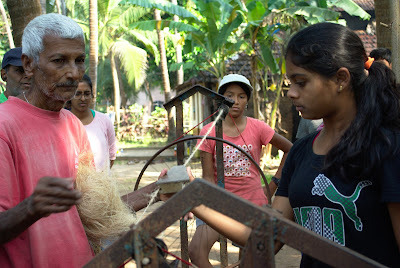 Got to know the method of preparing ropes from coconut coir. Coconuts were soaked in water for at least nine months in large pits which is dug during low tide. 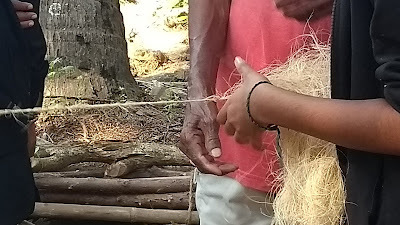 After which the shell becomes very soft and the fibers are cleaned, beaten, dried and ropes are formed using a spinning wheel. Rope obtained after this process just fetches around Rs5-10 per meter. And I could see how this art of rope making is slowly losing its importance because of plastics. For the upcoming study tours, I had to be in Angadibail. I visited Angadibail for the first time during the night and it was pitch dark when I reached the place. The moment I looked at the sky I felt as though I was in a natural planetarium. With no electricity, it took a while for me to adjust to the darkness. 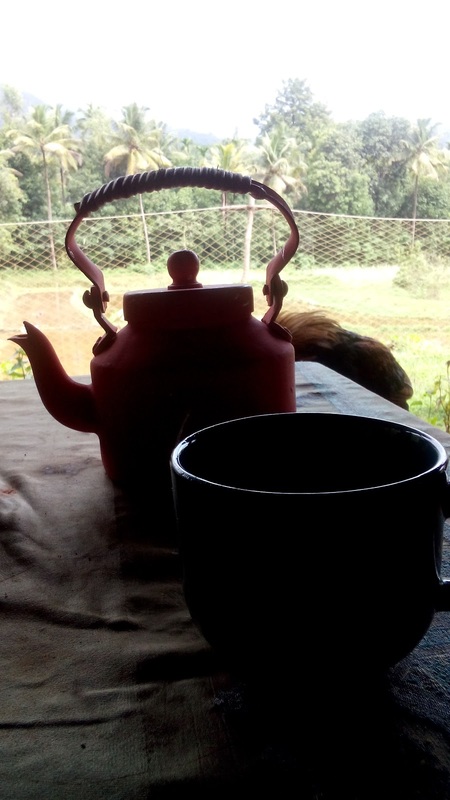 Waking up to the call of Malabar whistling thrush, spending some time with Beera (pet dog) and Bella & Thuppa(two cats) and sleeping hearing to the sounds of insects, Beera's growling, cats jumping became a routine in Angadibail. Preparing herbal tea and different flavors of ragi drink became my responsibility. 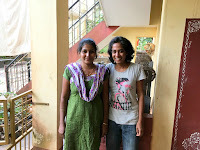 Got to know few lovely and talented people like Ishwaranna who takes care of almost everything at AngadiBail, Kafeel.. a traveler who has been in Angadibail for almost 8 months, GauriAkka and BabyAkka who braved to cook food on firewood regularly without whom we wouldn’t have got yummy food. Study tours turned out to be a great exploration for me where I witnessed many things for the first time. Interacting with school children, getting to know about quite a few birds and seeing so many colorful dragonflies, learning damami dance of siddhis, setting up the vegetable patch, learning basket weaving from Ishwaranna which is made using vines, mud brick making, hiking to Yaana and Vibuthi falls which I wanted to visit for so many years, harvesting paddy which I gave up after an hour of working in the hot sun, deskinning arecanut which I had seen at my grandmom’s place but had never tried are few of them. BuDa is creating awareness about these livelihoods among the kids, trying to bring back respect to the talent these master craftsmen possess which will help in reviving the art someday. 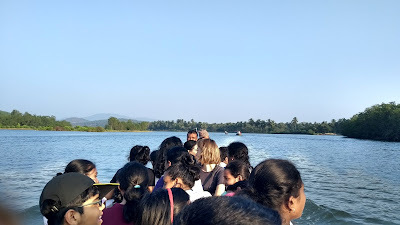 I had the chance to interact with three groups of students of different age groups and realized how we change as we grow, how various filters and lenses automatically come in. It was interesting to observe the behaviour of children of different age groups. I was amazed by the kind of energy kids had throughout the day, their innocence and curiosity, asking or demanding for things without fear, finding ways to have fun and of course finding new ways to bug us. Circle time was regularly held which I had experienced for the first time only in Bhoomi. After so many days I realized the importance of just stating our feelings and why it is so important to develop this habit among children. Initially, when I was asked to help in the study tours I was not sure given my zero-experience working with kids. But I just went with the flow, got so involved that in some cases felt a whole lot of vacuum when the kids group left. As part of the storytelling project taken up by BuDa, I got a chance to visit the government school of AngadiBail where the classroom was decorated with beautiful drawings made by kids. It raised few questions about the current education system. 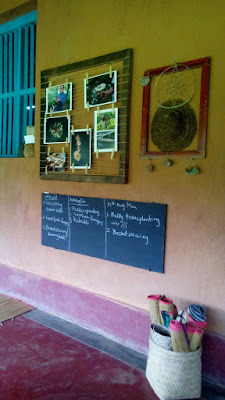 But felt good when I saw BuDa is working on forming a learning space involving local people, trying to revive the folklore stories by making a connection between the local tribes and the school children of the government school. 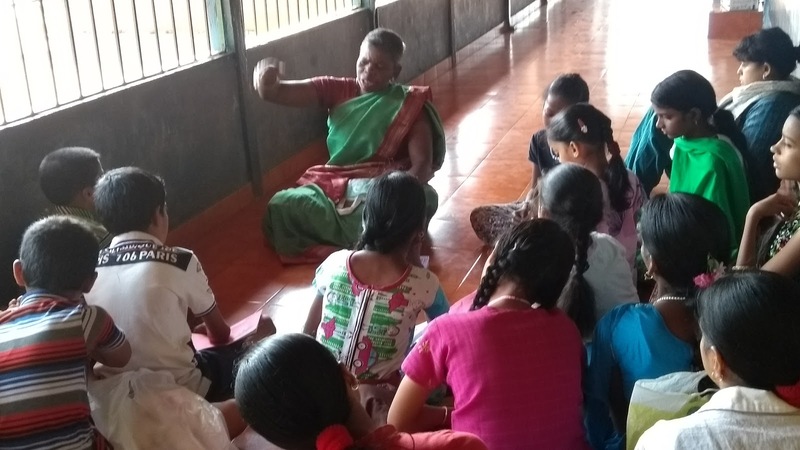 I enjoyed listening to Padmavathi Akka from Halakki tribe narrating the story in her own style and it was interesting to see how kids had tried to illustrate the stories. 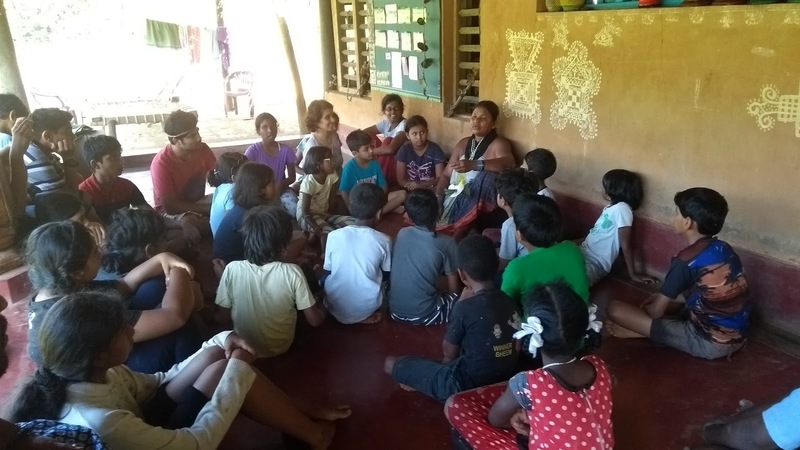 Idea was to make the kids come up with their own storybooks and reinstall the fact that their culture & language is no less compared to any other modern cultures or languages like English. I was cut off from the external world as there was no electricity and no network apart from a single BSNL mobile that was used by everyone. I realized how this whole concept of connecting with people through modern ways of communication is reducing the quality time we have, as in Angadibail I could feel time expanding and the amount of distraction was so less which made us focus on things to be done result of which the need for hurrying reduced. I visited few neighbor’s house to learn about plants and recipes and could notice instant warmth, none of them gave a second thought to invite me home even though I was a total stranger. One more thing I noticed was how trust plays a major role in boosting one’s confidence and even allows the freedom to experiment. This I realized when Savithakka gave me the task of making AkkiRottis/Ukkarisidha rotti. I was so touched with the outcome as many people joined hands in the preparing rottis and on the last day even few kids joined in. One more thing I noticed is the idea of sustainability with respect to ecology being practiced in most of the cases and the way Savithakka has come up with different initiatives to make BuDa financially sustainable also. It was very inspiring to hear Savithakka’s journey about BudaFolklore, challenges she faced and the resilience shown throughout. 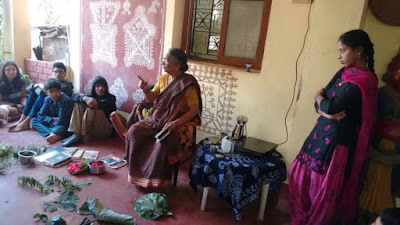 During my stay at AngadiBail I was lucky to meet and interact with Bhargavi S. Rao, Anthara Mukerjee, Sukta and Daawid. The other half of my internship was spent in Honnavara. I am fortunate to have got the opportunity to spend time with Shanthiamma and Savithakka’s father Dr.N.R Nayak who have worked for more than three decades in researching and documenting folklore knowledge of Uttara Kannada region. I was amazed looking at the energy levels of both and it helped me find out how much I was lagging. I cherish spending time watching sunrise daily overlooking sharavathi river joining the sea and the short-spanned interactions I had with Savithakka’s father. Shanthi amma a walking encyclopedia extremely passionate about her work. Shantiamma’s knowledge about plants is never ending and it keeps expanding even to this day. The way she used to notice all the small nuances in plants which she used to explain with so much interest was a treat to watch. Every day was a learning for me. 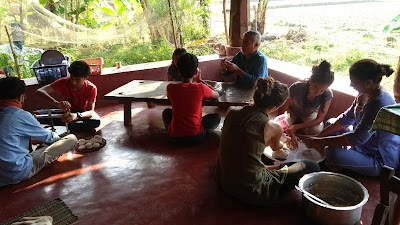 We used to speak about recipes, medicinal values, uses of different plants and quick home remedies when we used cook and eat together. I got to see and learn about lot of plants present in the house garden which is almost like a mini forest. Anyone who speaks to Shantiamma can literally feel that nature is so abundant. 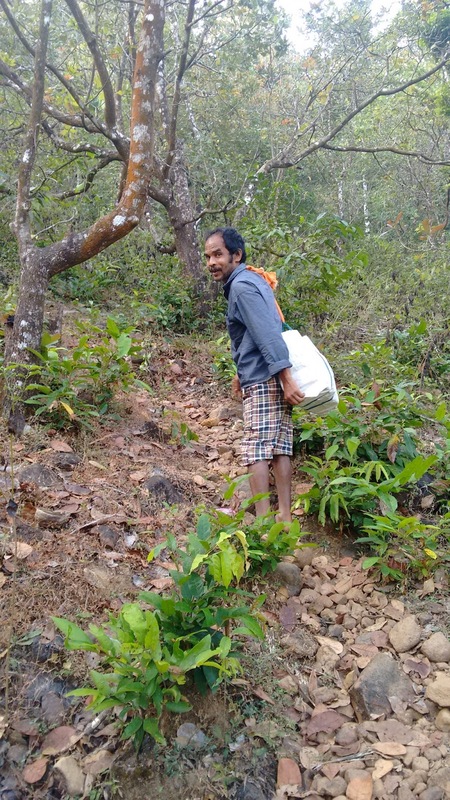 Shantiamma has documented so many traditional recipes and there is a separate book on Tambuli (buttermilk/coconut milk-based drink) which is a large collection of recipes of varieties of Tambuli. I even got an exposure to the variety of tubers present. Got the opportunity to translate a Kannada book written by Shantiamma about plants. It was fascinating to know interesting facts about plants for example Haade Balli from which jelly could be prepared, Jummana Mara whose bark looked like crocodile skin, varieties of Cassava, sea bean which comes with an interesting history and so on.. It was surprising to see that information about most of the weeds are already available on the internet, all one needs to know is the botanical name and we get to know the entire use with business value. I was lucky enough to taste many traditional dishes of Uttara Kannada Cuisine like Kotte Kadubu, Cucumber Kadubu, Kesu gedde Tava fry,Kesuvina gojju, Bangli Roti, Daalchinni Yele Kadubu,Kokum dishes, lots of tambulis. In the end we all had become like a family and I am very grateful to eah and everyone helping me learn and ponder over various things during my internship which of course will be remembered for a lifetime. All Savithakka had asked me was to come with an open mind and I realised its importance when I sit and look back now. Hoping to visit BuDa soon. The forest envelops its visitor, involving each of our senses in its deep and humble interactions. Vivid colours to feed the sight: from tiny individual leaves and flowers, to the immense landscape of tall trees and vast fields. No horns or tires screeching against the asphalt can reach you, but don’t expect the forest to be silent. The hearing is filled with a harmonious symphony of bird calls, gushing water, rolling winds, and crackling fires. 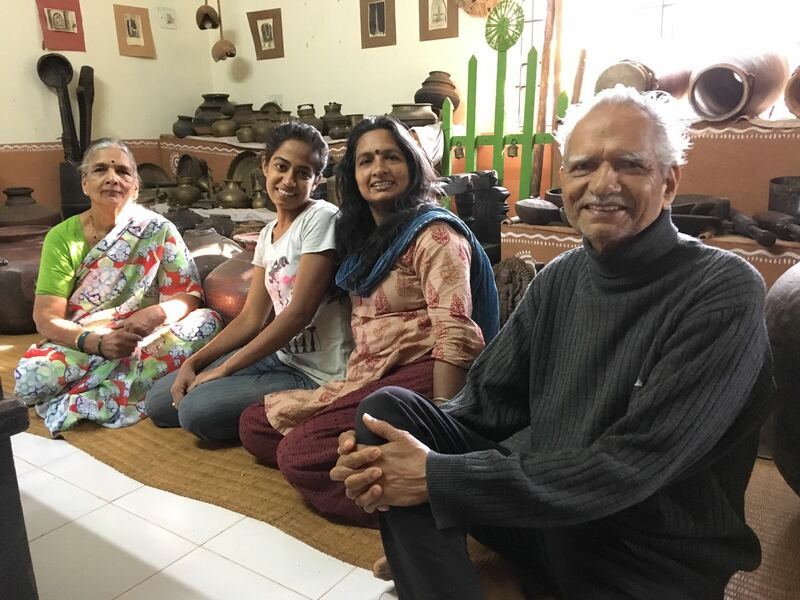 Instead of a modern stereo, the music emanates from the Siddi rhythms of goat-skin drums, forgotten tools humming in the kitchen, the animated voice in which Padmavati narrates her folk stories. The taste buds are excited by flavours of authentic recipes of Uttara Kannada, that allow us to taste the love in the food – imparting us an extraordinary energy to trek and walk on and on. The difference in taste is apparent from early morning – not waking up with the chemical toothpaste we are accustomed to, but with the taste of freshly powdered herbs, like cloves and dried guava leaves, using a natural tooth powder. All your tactile senses are regenerated from the powerful energy of the forest. Walking on the uneven earth, our barefoot soles sense rough rocks and smooth pebbles, the cool water of the stream, forest steps carved from tree roots, sometimes, sharp thorns.. Feeling from the ground up, our souls are freed from the urban comforts. New smells continuously wafting through – freshly harvested black pepper, sweet Mahua flowers, smouldering charcoal, and even fertilising cow dung. At BuDa, the freedom can be smelled. Our fingers learn to make crafts out of natural things and learn to stitch new realities. As Naghul noted, “many things can be used for more than their purpose” when some of the boys fashioned ladles out of coconut shells. 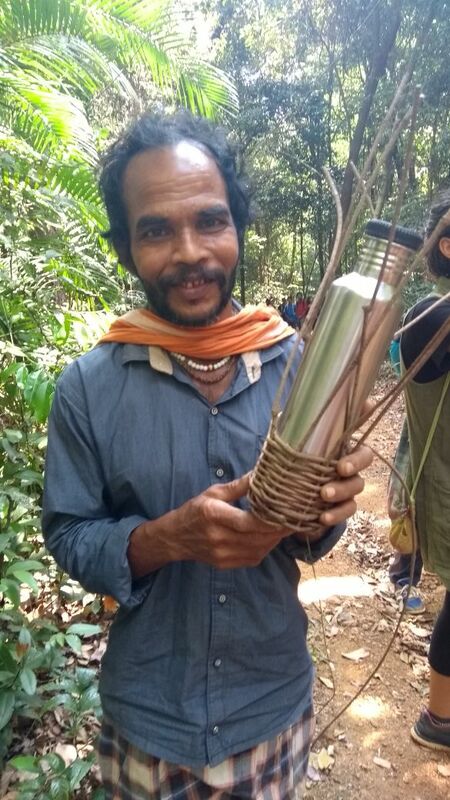 The group learnt how creepers they cut down from the forest could be woven into baskets, mango and jackfruit leaves could create crowns and craft jewellery, and bricks could be moulded from the right combination of mud, water, and cow dung. On the last day, the roles in the kitchen were reversed as the children took charge of preparing the meal for all the Akkas and Annas from BuDa and Paathashala. 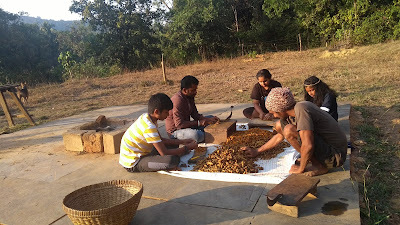 From shopping in the local vegetable market, to stoking the fires.. Anirudh captures it well in his words: "One of the most memorable moments for me was when I cooked food along with my peers and when the people tasted and they really liked it." 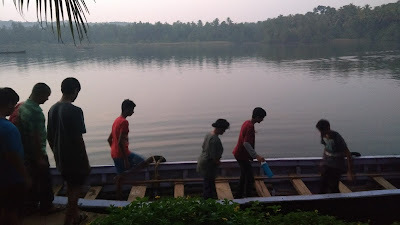 To wrap it all up, in the words of Hamsa Akka: "The week has been like travelling along a gentle river with long forgotten friends; comfortable, relaxing and exciting. One feels the need to revisit these days. There is no melancholy or sadness that the trip has ended. It seems more like a beginning of good things." Please ask first before using any of the photos on this blog. I love sharing, but like to be asked first. Savita uday. Travel theme. Powered by Blogger.